Bougainvillea (Bougainvillea) is not a typical houseplant—in its natural form, it is a sprawling climber and shrub with formidable thorns. It is suited to a somewhat arid, subtropical to tropical climate and thrives outside in U.S. Department of Agriculture plant hardiness zones 9 through 11. That means most Americans can't grow bougainvillea outdoors. But these plants possess something many indoor gardeners prize: color. During bougainvillea's blooming season, its insignificant flowers are surrounded by bracts of blazing color in bright purples, pinks, oranges, and other hues. As an added bonus, these plants are easily trimmed and trained and, with an experienced hand, can make a striking container plant indoors for all those who find it appealing but don't live in a climate that will support bougainvillea outdoors all year long. Keep these best practices for growing bougainvillea in mind for your indoor plant to reap its full reward. Light: Full sun. Many growers move bougainvillea outside during the summer months. Water: Keep evenly moist during the summer and nearly dry in winter. 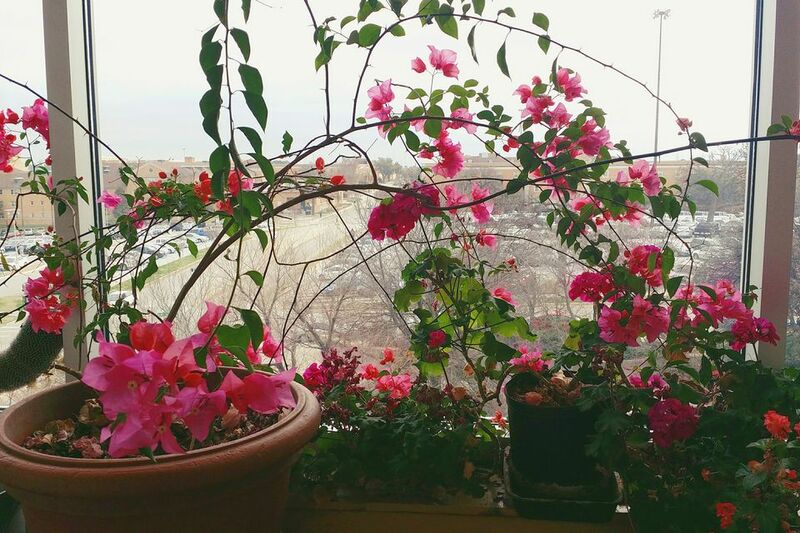 Bougainvillea blooms better with drier winter conditions. Temperature: Relatively hardy. These plants are able to withstand tropical high temperatures and cold down to the mid-40s F. If you've moved your bougainvillea outside for the summer, keep an eye on falling nighttime temperatures in the autumn and bring it in if the temperature is expected to fall below 50 F. Likewise in the spring, be careful not to take it outside until nighttime temperatures warm up to around 50 F.
Soil: Well-drained potting mix with plenty of perlite. Fertilizer: Feed your plant in the summer with weak liquid fertilizer weekly or use controlled-release fertilizer. Use branch cuttings with a rooting hormone in the spring, with bottom heat provided. Bougainvillea is not easy to propagate by most home gardeners, so several attempts may be necessary. Bougainvillea grows rapidly and in suitable outdoor environments will quickly grow into small trees or large clumping shrubs up to 15 feet high. In containers, the idea is to control this growth by yearly repotting and root pruning in the spring. Once the plant is large, repot it every two years. The basic variety is Bougainvillea glabra. However, this plant has been extensively hybridized, so most bougainvilleas you'll find in garden centers are hybrids. Choose your bougainvillea based on its bract color and shape. Care requirements are similar regardless of which variety you choose. You will likely encounter one of two problems with your bougainvillea: lack of blooms or too-rapid growth. If the plant is not blooming, cut back on watering for a few weeks. They naturally bloom in the spring and seem to bloom harder in drier years. Bougainvillea needs to be trimmed to maintain its shape. However, be aware that bougainvillea flowers along its long branches so aggressive pruning of new growth will reduce bloom color. The best approach is to prune in the autumn after the growing season is complete so the plant will bloom from next season’s new growth.